We sometimes think there are only two ways to discern God's will---the "divine blueprint" plan and the "grow in wisdom" school. Smith offers a third way! Drawing on centuries of teaching and experience, he suggests that discernment is a spiritual discipline---a deepening relationship that helps us see God's will in crisis and in daily life. - Publisher All Christians yearn to live at the center of God's will. But how to discern his will is an art that eludes many of us. And the advice we get often conflicts.Some tell us to look for a divine "blueprint"-the one perfect plan for our lives that we need to find. We are encouraged to search the Scriptures and hunt for signs, trying to uncover the map of our lives that God has drawn.Others have rejected the blueprint school of guidance for the "wisdom school." With minds renewed by the teaching of Scripture, we are to develop the wisdom necessary to make wise choices. We are told not to expect that there is just one answer to God's will for every decision we face. 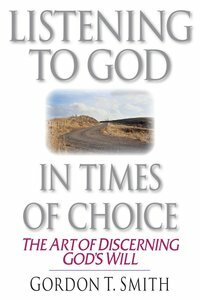 Several may be possible.The difficulty with both approaches, writes Gordon Smith, is that they minimize the presence and voice of God in times of choice. Instead, he argues for a third way. He suggests that we develop discernment as a spiritual discipline. By stressing the personal aspects of growing in our relationship with God, we can understand his will, not just in times of crisis but throughout our daily lives.This book provides no magic formulas, no recipes for guaranteed success-just a lot of insight, gleaned from centuries of lived Christian experience, that will guide and encourage you in the art of discerning God's will. About "Listening to God in Times of Choice"
All Christians yearn to live at the center of God's will. But how to discern his will is an art that eludes many of us. And the advice we get often conflicts.Some tell us to look for a divine "blueprint"-the one perfect plan for our lives that we need to find. We are encouraged to search the Scriptures and hunt for signs, trying to uncover the map of our lives that God has drawn.Others have rejected the blueprint school of guidance for the "wisdom school." With minds renewed by the teaching of Scripture, we are to develop the wisdom necessary to make wise choices. We are told not to expect that there is just one answer to God's will for every decision we face. Several may be possible.The difficulty with both approaches, writes Gordon Smith, is that they minimize the presence and voice of God in times of choice. Instead, he argues for a third way. He suggests that we develop discernment as a spiritual discipline. By stressing the personal aspects of growing in our relationship with God, we can understand his will, not just in times of crisis but throughout our daily lives.This book provides no magic formulas, no recipes for guaranteed success-just a lot of insight, gleaned from centuries of lived Christian experience, that will guide and encourage you in the art of discerning God's will. Gordon T. Smith (Ph.D., Loyola School of Theology, Ateneo de Manila University) grew up in Ecuador and is president of reSource (formerly Overseas Council Canada), which works with other reSource affiliates to support and enable excellence in theological education in the developing world. Formerly academic dean and associate professor of spiritual theology at Regent College in Vancouver, British Columbia. He is author of a number of works in theology and the spiritual life including A Holy Meal; Beginning Well: Christian Conversion & Authentic Transformation; Courage and Calling; Listening to God in Times of Choice and The Voice of Jesus.